When composing a dissertation, it is essential to choose a topic within your subject area that enables for discussion and critical evaluation intending to producing some fresh understanding. Selection of right and appropriate topic for writing a history dissertation is often a critical and a remarkable phenomenon. 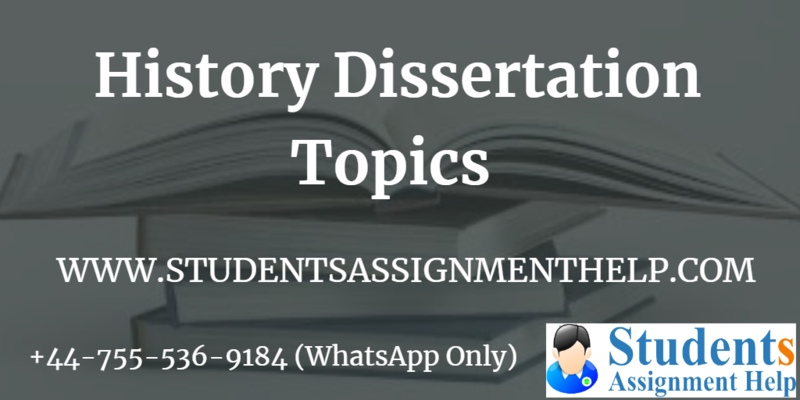 Therefore to help you out StudentsAssignmentHelp.com is offering its History Dissertation Topics services to the students in need. History within itself is so enormous, and there occur various historical events ranging prehistoric times to modern era. This is an academic discipline which consists of records and events and for students pursuing this subject is a brave attempt. To gain higher grades in final examination and earn your academic degree it is indispensable for every final year scholar to present a history dissertation. To draft this long piece of writing students need to a great hard work. History dissertation writing is a lengthy process and and it include various stages of writing. Many a times students do not have an idea off where to start their dissertation writings from. It is not possible for the students to go through all its stages effectively. Hence, they choose to hire professional dissertation assignment experts who can go through all the critical stages of dissertation writing and present you with the best history dissertation that can bring you winning grades. Our experts will help you write a superb dissertation that will definitely win hearts of your university educator. All the dissertation helpers online we have in our team holds highly professional degrees in this field. They have knowledge about each topic in this field. Even if you bring us a complicated history dissertation topic it is not difficult for our experts to guide you in it. You can also get tips on dissertation structure from our expert writers. Some of the history dissertation topics are listed below which you can take help from our writers. How did Russia move from being one of the Wests staunchest allies during the Second World War to begin universally feared after that? Was any one party to charge for the First World War, if so, who and why? What were the main problems faced by the government in this period and were they ever adequately resolved? What was the main cause of the Second World War? How great was the US impact upon the war? What changed when they entered the conflict in Europe? These suggestions will certainly help you to pick up the best topic for your history dissertation. What students obtain when they choose StudentsAssignmentHelp.com for history dissertation topics? 100% plagiarism free and unique assignments. StudentsAssignmentHelp.com provides the best dissertation writing services Singapore at an affordable cost. You can get the best law dissertation help, history dissertation help, dissertation editing services, etc from our website. The Professional Dissertation Helpers we have in our team are well-educated and hold high academic degrees from the top universities around the world. We will always provide you a well-researched dissertation writings that will make you score high academic grades.